A dazzling array of exotic tropicals cover a wall at the entrance to San Francisco’s Conservatory of Flowers in Golden Gate Park. The vertical garden was donated by Chris Bribach of Plants On Walls. Florafelt Vertical Garden Planters were hung from Unistrut members that were clamped to the building. Volunteers at the conservatory added exotic species of plants and also care for the vertical garden. Florafelt Vertical Garden. San Francisco Conservatory of Flowers. 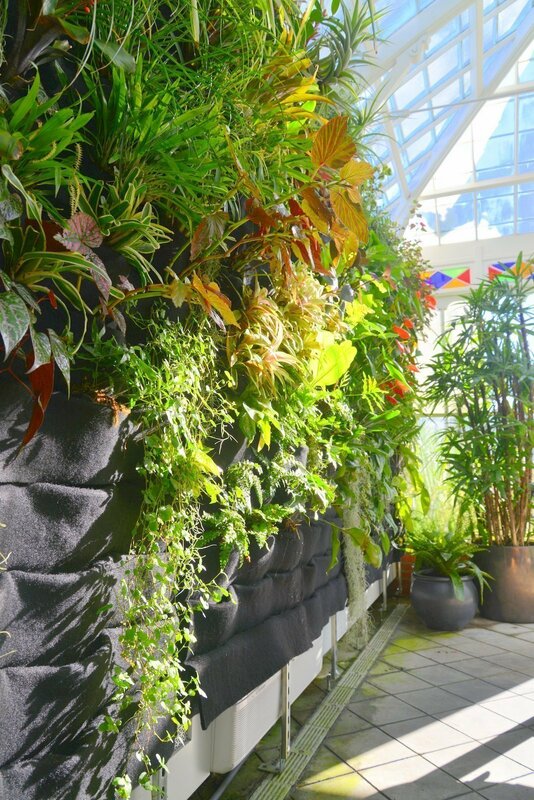 The Vertical garden is located in the front entrance, and offers visitors a welcome bursting with color and intrigue. Florafelt Vertical Garden. S.F. Conservatory of Flowers.